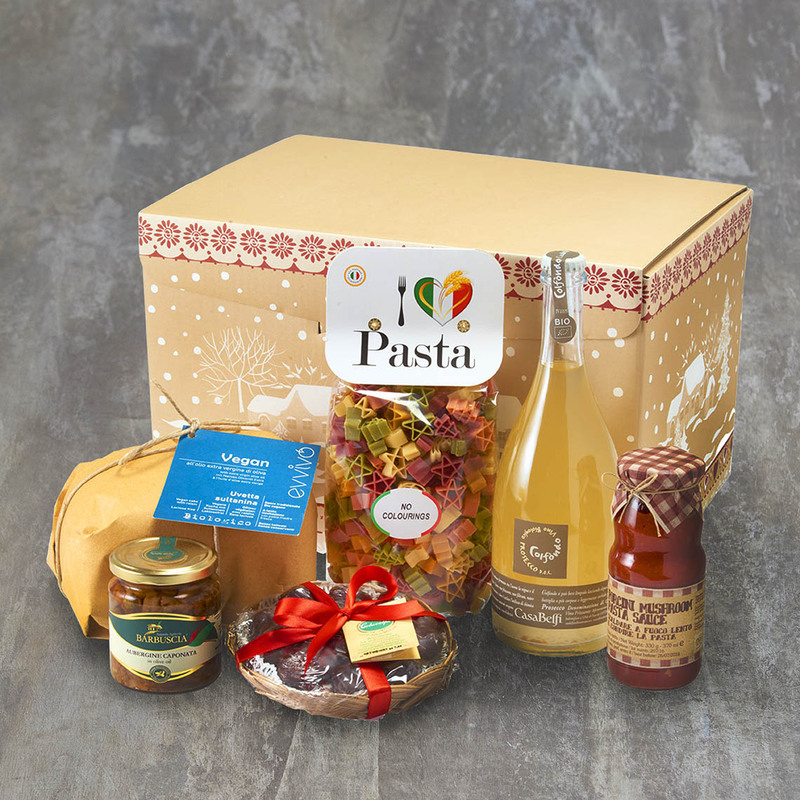 This brand new vegan Christmas hamper has been put together to create a feast of incredible, Italian flavours! Every product is cruelty free and vegan friendly - although of course there's no reason why non-vegans wouldn't love it too! Bottle of Organic Vegan Prosecco 750cl. This wonderful organic, bio-dynamic, natural Prosecco has been made in the Veneto region of Italy with traditional farming techniques, completely organic viticulture and very low intervention. Organic Vegen Panettone 500g Made with 100% Italian extra virgin olive oil, the staple ingredient of the mediterranean diet and prepared with stone ground, whole grain flour with wheat grown in Piemonte it contains sweet, plump raisins and natural, orgaic ingredients.- No preservatives, no added flavours, only mother yeast.- 32 hours of natural leavening.- Vitamin E and polyphenols from extra virgin olive oil. Artichoke Hearts in Olive OIl 314ml These tasty whole Italian artichoke hearts are a much loved Sicilian antipasto. Super soft and tender but crisp at the same time, they have been selected and picked one by one, by hand and placed fresh into the jar. They are preserved in locally produced Sicilian olive oil. Sicilian Aubergine Caponata 190g Made from chopped aubergines and other mixed veggies, Caponata is a traditional, much-loved vegan dish which is full of Mediterranean flavour. Porcini Mushroom Pasta Sauce180g The Porcini mushrooms in this tomato pasta sauce transform it into something really special. This is a healthy sauce with a rich, intense flavour – just add it to some of your favourite pasta for a truly memorable dish. Natural 5 Colour Heart Shaped Pasta 500g These naturally colourful pasta shapes will add fun and colour to any recipe! Our little hearts have been flavoured with tasty spinach, beetroot and turmeric.